- Summer Berry - Vanilla soft serve topped with layered vanilla cake, raspberries, blackberries, blueberries, choco chunks, and whipped topping. - Brownie and Oreo - Vanilla soft serve topped with a Triple Chocolate Brownie, Oreo cookie pieces, chocolate sauce and marshmallow topping. 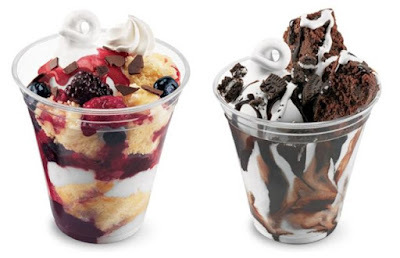 Cupfections are a bit more complex than Dairy Queen's normal sundaes, which are typically just vanilla soft serve topped with one of several sauces.